NAPE Summit now stretches across an entire week, and the first two days premiered full-day education courses by the Independent Petroleum Association of America and the Association of International Petroleum Negotiators. IPAA’s Oil and Gas Overview Course drilled down into the functional and commercial aspects of the upstream industry, while the AIPN Seminar explored the latest best practices in international lease negotiations. Participants gave rave reviews to the new courses, which we anticipate will return and possibly expand for NAPE Week 2018. Sponsored by Concho Resources, the daylong NAPE Global Business Conference moved into the Grand Ballroom, where industry leaders shared their insights on worldwide energy forecasts and developments with a crowd of almost 900, who enjoyed the 2017 event’s more sophisticated staging and new bistro coffee bars. The conference’s nine sessions explored the recovery of the global oil and gas industry, best practices in shaping the public perception of oiland gas development and cross-border partnerships in energy. Opening presenter Robert Clarke, research director for Wood Mackenzie, shared his anticipation for an aggressive industry bounce back. “The U.S. added 82 rigs in the last four weeks, which made this the largest single-month rig addition since early 2011,” he told attendees. This optimistic outlook was seconded by Parsley Energy Chairman & CEO Bryan Sheffield, who presented on the rising development activity in the Permian Basin during the NAPE Global Business Conference Luncheon sponsored by Australia Petroleum. “The Permian is the area that will lead America to energy independence,” he said. “It’s an exciting time. Lots of things are changing, and there are deals to be made — like at NAPE, where deals do happen.” The second portion of the luncheon included a 2017 energy outlook from Todd Onderdonk, senior energy advisor of Corporate Strategic Planning at ExxonMobil. Onderdonk explored the positive impact access to energy can have on the quality of life of local communities and what an energy recovery would mean for international markets. “Turning the Tide” panelists Jacki Pick, COO and executive vice president for the National Center for Policy Analysis, together with Brigham McCown, chairman of the Alliance for Innovation and Infrastructure, discussed how energy companies need a new approach to communicating with the public. They explained that companies need to better educate people on the many essential household products that are made from petroleum, as consumers often take these products for granted. Additional NAPE Global Business Conference presentations included Joe Navarro, former FBI agent and bestselling author; James English Sr., international negotiator for Anadarko Petroleum Corp.; Steven Otillar, partner at Akin Gump Strauss Hauer & Feld LLP and AIPN president-elect; and Francisco Garcia Cabeza de Vaca, governor of the state of Tamaulipas, Mexico. Illustrating the importance of cross-border partnerships in global energy development, Gov. Cabeza de Vaca shared that NAPE has a different meaning to him — “Nuevos amigos por el estado” or “New friends for the state.” He commended Texas and its ongoing energy partnerships with Tamaulipas. Day three concluded with the ever-popular Icebreaker networking event, sponsored by Holland Services. been a very successful show for us.” Exhibitors and attendees alike also enjoyed the convenience of having domestic and international exhibitors share the show floor, as opposed to the separate international area as in years past. 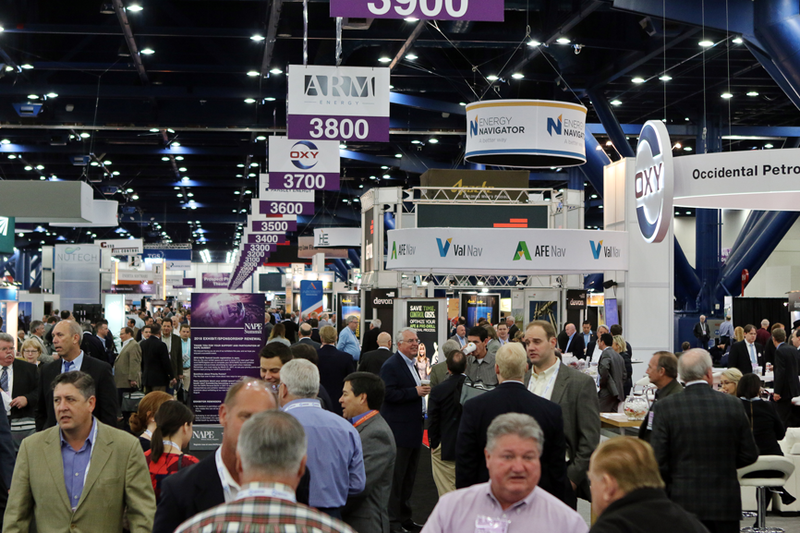 NAPE Summit hosted three preview theaters on the exhibit tradeshow floor: domestic prospects, international prospects and capital/service providers. These previews gave attendees the snapshots they needed to make the most of their time at the expo. PLS hosted the daylong Domestic Prospect Theater — nicknamed the “Shark Tank” of the E&P business. Twenty-five companies showcased their best prospects, which were mostly bread and butter conventional deals, as reported by PetroScout. industry. “This is a fascinating time for the industry,” said the retired four-star general. “It is the time to cut costs and lower risks. We are experiencing a revolutionary change in the energy industry — shifting toward ways we can go off the grid and decentralize energy.” Powell told the crowd of more than 1,000 that while he can sense the anxiety and concerns among the audiences he addresses, he also sees confidence in the American people. “There is a resiliency in our society,” he said. “We are a country that has been separated. We have to bridge the differences in our thinking and [how we] talk to each other, like our founding fathers once did.” The NAPE Charities Luncheon donated $60,000 each to Canine Companions for Independence, Operation Homefront and Support a Soldier. 2017’s $180,000 in donations brings NAPE’s total to more than $3 million given since 2009 to charities supporting U.S. veterans.